COLONNA ORGANIC PERANZANA: Organic extra virgin olive oil produced exclusively from 100% Peranzana variety olives. This unique variety, imported to Eastern Italy from Provence in the 18th Century by the Duke of Sangro, has unmistakable notes of fresh herbs, flowers, green tomato and freshly cut wheat. It is sweetly fruity with a gentle, spicy aftertaste with hints of almond and artichoke. This extra virgin olive oil is highly aromatic and well-structured but not aggressive. OLIO DE CARLO IL CLASSICO: “Il Classico" from Olio De Carlo is made from stone-crushed Ogliarola and Coratina olives harvested in the Bitritto countryside by carefully selected farmers who have worked with the De Carlo family for generations. The Ogliarola and Coratina olives, harvested straight from the tree, are processed within 24 hours in the company olive press. The resulting oil has a strong olive aroma with hints of artichokes and green almonds. Its flavor is soft and balanced, characterized by hints of fresh grass with a sweet almond aftertaste. Its subtle taste is ideal for adding flavor to all kinds of dishes without altering the particular characteristics of the raw ingredients used. Try with boiled or baked fish, fried seafood, sauces and roast meats. 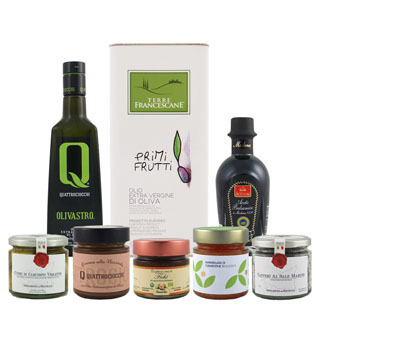 GUGLIELMI FRUTTATO BIOLOGICO: This organic extra virgin olive oil is obtained without the use of pesticides and fertilizers, using attentive care for the environment and nature by safeguarding the territory from which it is obtained. Obtained exclusively from Coratina and Peranzana olives and rich in healthy polyphenols, this oil is dense and full bodied, distinguished by its fruity green notes of medium intensity with a touch of spiciness. Herbaceous nuances characterize its aromas, which are dominated by strong green notes of fresh herbs, artichokes and garden vegetables. Use this oil with roasted meat, grilled vegetables, bruschetta, pizza and full-flavored sauces and as a condiment for game, meat or beef carpaccio. LIBRANDI ORGANIC FRANTOIO: Cold-extracted from organically farmed Frantoio olives hand-picked on the Librandi estate in the province of Cosenza, Calabria. The aroma is intense with distinct hints of artichoke and cardoon. Its flavor is broad, strong and complex with hints of vegetables accompanied by a pleasant bitterness and spicy finish. Try this oil over fresh-picked garden vegetables, fish soups, beef carpaccio, pasta, game and aged cheeses.